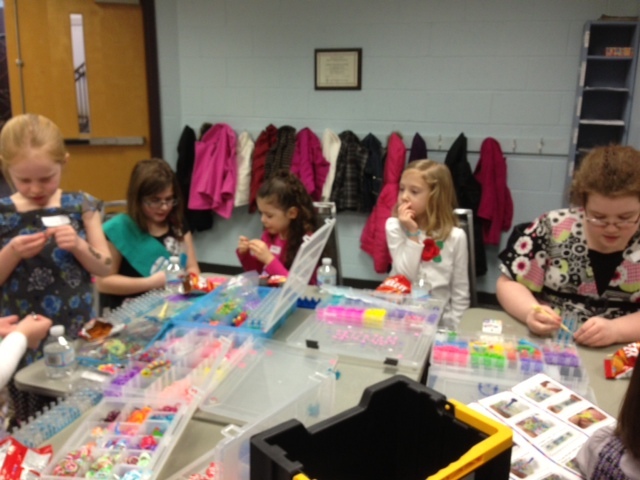 The Girl Scouts from Brownie Troop 40967 rang in the New Year by assisting those in need. During the holiday season they completed several service projects which helped them earn the Philanthropist Badge, a designation that helps Brownies learn about helping others and distinguishing between wants and needs. Read the full article at www.NJ.com. More than 330 Cranford Girl Scouts participated in the annual decorating of the Cranford Holiday Tree in Mayor's Park on Friday, Nov. 23. More than 350 members of Girl Scouts of Cranford Service Unit 48 and their volunteer leaders held a two-day encampment at Hanson Park, Sept. 22 and 23. CRANFORD – Dozens of Girl Scouts from Cranford Service Unit 48 gathered on Tuesday evening at the Cranford Municipal Building to be honored by the Cranford Township Council as it issued a proclamation recognizing March 9 – 16 as Girl Scout Week. Read the full article at www.TAPintoCranford.com. Read the full article at TAPintoCranford. Cranford, NJ – On the evening of May 23rd, the Girl Scouts of Cranford, Service Unit 48, presented the national organization’s most prestigious honor – the Gold Award – to three young women of Cranford, NJ. Read the full articles at TAPintoCranford and NJ.com. Cranford Girl Scout Troop 40444 recently collected, wrapped and donated birthday gifts for distribution to foster children through the local nonprofit, A Birthday Wish. The Cadette-level middle-schoolers gathered gifts fulfilling wishes for foster children served by CASA of Union County and other CASA programs in the state. Troop members and their co-leaders held a gift-wrapping party with A Birthday Wish founder Jane Hoffman, second from left, below, and the presents are now headed off to their birthday girl and boy recipients. Hoffman began A Birthday Wish in 2014 in partnership with CASA of Union County, and has since expanded its reach to multiple CASA programs within the state, working to ensure the birthdays of foster children are not forgotten and, instead, are celebrated -- just as each child should be. Read the full article at CASA of Union County. The Cranford Township Committee honored girl scouts who received their Gold and Silver Awards at Tuesday night’s meeting. Isabella Stoto, Ellen Rokicki and Julia Lachenauer received proclamations and keys to the township for earning their Gold Awards after completing individual projects. Cranford Girl Scout Cadette Troop 4044 donated 29 birthday gifts to foster children in Union County through their recent partnership with A Birthday Wish. The Cranford Township Committee honored the 106th Anniversary of the Girl Scouts at Tuesday Night’s meeting. Scouts from Cranford's Senior Troop No. 40113 and Cadette Troop No. 40534 were on hand to lead the flag salute and accept a proclamation from Mayor Thomas Hannen, Jr. The Girl Scouts of Cranford hosted nearly 200 Girl Scouts of all ages at the fifth annual Pinewood Derby Day. Cadette Troop 40444 of Hillside Avenue School organized the races that took place on Saturday, Jan. 27 at the Cranford United Methodist Church. Cranford teen Julia Lachenauer hopes to ease the financial burden of tutoring for younger students by creating a free, drop-in tutor program. Several Girl Scout troops of Cranford (48) have come together to create a vegetable garden that will provide healthy options to those in need throughout the community. The garden is a result of the "Sow What?" Girl Scout Leadership Journey for Senior Level troops in 9th and 10th grade. The Journeys encourage girls to learn about environmental topics such as clean water and air, noise pollution, global warming, soil contamination, and agricultural processes. CRANFORD, NJ - The Girl Scouts of Cranford Cadette Troop 40444 of Hillside Avenue School hosted the fourth annual Pinewood Derby Day Saturday Jan. 28. The race which was held at the Cranford United Methodist Church saw 184 participants, a record-breaking number. Racers of all ages gathered throughout the day to put their hand-crafted cars to the test, competing for one of the top prizes. Read the full article at www.Tapinto.net. 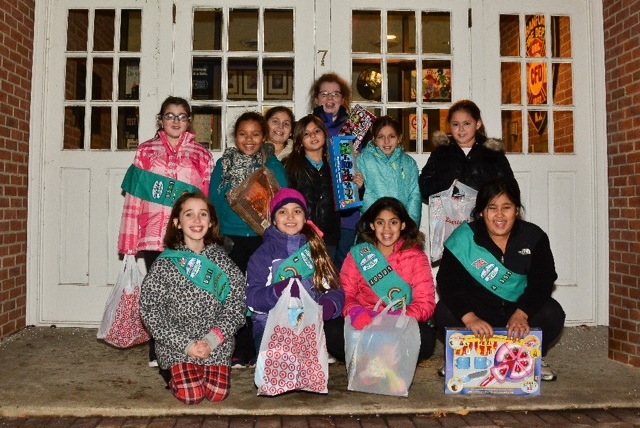 CRANFORD, NJ - Cranford Brownie Troop 40013 organized and hosted the Girl Scout Daisies, Brownies, Juniors, Cadets, Seniors & Ambassadors of Cranford in decorating the Holiday Tree in Mayor’s Park, Friday Nov. 25. More than 300 girls and 33-plus troops participated in the annual event that was sponsored by the Cranford Chamber of Commerce. CRANFORD, NJ - Newly formed Walnut Avenue School Brownie Troop 40772 has set out to give back to the community. At its first meeting the girls chose the troop's crest. The meaning of the crest is based on what is most important to them and what they want their troop to stand for. Without seeing the image beforehand the girls chose the unicorn because it is important for them to have the courage to spread beauty with words and actions. The girls are learning the importance of being kind to others and the impact that these second-graders from Walnut Avenue School can have on the world. On June 27 several girl scout troops departed for the Dominican Republic where they we had an amazing opportunity to work with the Mariposa Foundation. Read the full article on the Cranford Monthly page 19. On the evening of May 25th, The Girl Scouts of Cranford presented the national organization's most prestigious honor – the Gold Award – to four young women of Cranford, NJ. The Gold Award recipients - Claire, Candice, Kacey and Caroline - were honored at a recognition dinner at Cranford's Social Club. Read the full article at TAPinfo.NET and on NJ.COM. The Girl Scouts Heart of New Jersey honored members of the Girl Scouts of Cranford Service Unit at a dinner held on April 12, at the Doubletree by Hilton Somerset Hotel and Conference Center. Read the full article on TAPintoCranford. For the second year in a row, Cranford Brownie Troop #40222 collected 34 pajamas and 34 books for The Pajama Program, a non-profit organization that provides new books and pajamas to children in need nationwide. On Thursday, June 18, 2015, Cranford Junior Girl Scout Troop 40071 made their Bronze Award Presentation to the residents of Cranford Senior Housing. The program was called "Be Happy! Be Healthy! A Way for Juniors to Help Seniors!" The goal was to have fun educating our local Seniors on three topics: Healthy eating, which included delicious samples of healthy snacks like hummus, fruit kebobs, and guacamole; a fun skit on keeping the mind sharp by exercising the brain, getting enough sleep, and keeping up an active social life; and finally, a presentation on the benefits of exercise which included a fantastic Chair Yoga Class taught by Rachel Cavanna. In addition to the presentations, the Troop handed out recipe cards, a list of 10 Tips for Keeping Your Mind Fit, and a sheet of yoga poses for the Seniors to practice at home. Finally, everyone played Bingo for "healthy" prizes of word and number puzzle books, fresh flower arrangements from Flowers by Maggie, and locally donated gift certificates from Back to Nature Health Foods and Alluem Yoga. Without doubt, both the Juniors and Seniors had a fabulous afternoon. Congratulations to Junior Troop 40071 for a job very, very well done. CRANFORD, NJ - The Girl Scouts of Cranford recently held a ceremony to honor a group of scouts who have achieved the ultimate recognition in the scouting community due to their commitment to service and a desire to make a difference in the community. Read the full article, including a few videos at www.tapinto.com. During a dinner held on April 22, at LÁffaire Catering in Mountainside, The 2015 Girl Scouts Heart of New Jersey honored members of the Girl Scouts of Cranford Service Unit. CRANFORD, NJ - Last weekend Cranford Girl Scouts participated in the 2nd Annual Powder Puff Derby. This year there were a total of ninety girls participating in the event. The girls were grouped by age, with a total of five groups. The event was run by Junior Troop 40444 from Hillside Avenue School. On Wednesday, May 27, 2015, Girl Scouts of Cranford honored a group of sister scouts who have achieved the ultimate recognition in the scouting community due to their commitment to service and a desire to make a difference in the community. At the awards dinner held at the Westwood in Garwood, several young women were the recipients of the highly prestigious Girl Scout Gold Award, which represents the highest achievement in Girl Scouting, the Girl Scout Silver Award, which is the highest award a Girl Scout Cadette can earn, and the Distinguished Girl Scout Service Award and Scholarship -2015 which requires over 40 hours of community service as a mentor to younger scouts. Congratulations to all of the honorees! Read the full article at www.Patch.com. Calling all Girl Scouts and Leaders! Let’s end Girl Scout Week by celebrating girls with a pancake breakfast. Consider taking your Mom, Grandmother, Godmother or favorite Aunt to enjoy the most important meal of the day. You can call it an early Mother’s Day celebration or a belated Valentine’s gift. You can also make it a special family day by having a leisure breakfast with no fuss or muss. Call your friends that you don’t get to see often and celebrate the Vernal Equinox (first day of spring), which begins on March 20th at 6:45 p.m. Seriously, all too often women and girls are not recognized for all they do. The courage, confidence and character that we develop while in scouts sets us up for success in the future. The Scholarship Breakfast is to raise money to award a scholarship for those girls who have given their time unselfishly while in high school to help the Cranford Girl Scout Community. Read the full article at TAPinfo.net. Craving those famous Girl Scout Cookies? Your wait is almost over. Starting Saturday, March 28, downtown Cranford will be filled with smiling girl scouts of all ages touting their famous cookies. The Girl Scouts of Cranford will be offering some of the most recognized signature cookie varieties including Thin Mints, Tagalongs and Trefoils. Each traditional box of cookies is $4.00. This year, the organization also offers “Toffee-Tastic!” – a rich, buttery, gluten-free cookie with tons of toffee chips for $5.00 a box. To date, sales are up 5 percent from last year and boxes for donation are up 19 percent. “We will have plenty of boxes for booth sales this year and the girls are very excited to celebrate the positive impact they make on their community through the Girl Scout Cookie Program" said Kristin Santos, Service Unit Manager of the Girl Scouts of Cranford. The group sold 34,642 boxes of cookies during 2014's cookie program. On Friday, March 6, Girl Scout Daisy Troop 40222 of Brookside Place School in Cranford, welcomed Sensei Mario Cesario - owner and chief instructor at Cesar-Kai Academy in Cranford - to discuss anti-bullying and self defense. The Daisy Troop earned their Courageous and Strong badge, just one of 10 petals required before becoming a Girl Scout Brownie. Sensei Mario graciously donated his time and energy to the Daisy Troop and all the girls walked out with their heads held a little higher. See the article on NJ.COM. Brownie Troop 40035 of Bloomingdale Avenue School in Cranford completed their Painting Badge under the direction of retired art teacher, Patricia Novy of Clark. Scout leaders Megan Quigley and Monica Connolly arranged for their twelve scouts to work with Novy at monthly meetings. They first learned about Monet, van Gogh, Degas and Jackson Pollack as well as women painters: Janet Fish, Grandma Moses and Georgia O'Keeffe before painting on their own. Read the entire article on NJ.com. Girl Scout Junior Troop 40551 coordinated the Girl Scouts participation in the Cranford Chamber of Commerce tree decorating event as well as hosted a Operation Shoebox drive. A big thank you to all of those who contributed and attended! Girl Scout Cadette Troop 40046 assembled paper lanterns that were used in multiple Light the Night walk events around New Jersey. Light the Night walks are sponsored by the Leukemia & Lymphoma Society. They raise funds for blood cancer research, information and advocacy. Visit http://www.lightthenight.org for more information on the event. 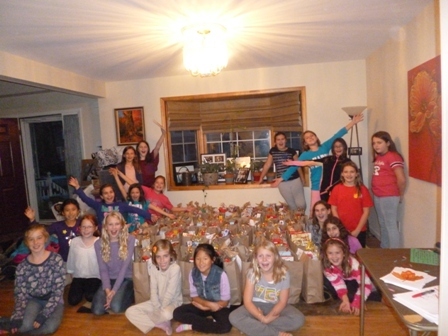 Cranford Junior Troop 40071, pictured with their packing helpers, Brownie Troop 40753, completed its Take Action Journey Project by collecting food to fill 65 bags of "Thanksgiving Trimmings" to donate to Cranford Family Care. My name is Caroline Eimer, I am a junior at Cranford High School, and I would like to thank many of the local businesses in downtown Cranford. This past spring myself and some supportive friends went door to door in almost every store and spoke to the managers of local shops telling them about juvenile arthritis, which I live with, and asked them to donate money to the Arthritis Foundation's annual Walk to Cure Arthritis. The Arthritis Foundation helps fund research and support, just to name a few. Hillside Avenue School 4th grade Junior Troop 40551 completed their community take action project by volunteering their time during the school year planning a project with Calvary Nursery School (CNS). The butterfly garden was a serious project with lots of planning and coordinating by Stacy Nick, the director of CNS. The garden will be a certified monarch waystation by having the required plants for a natural habitat of the monarch butterfly. The monarchs are endangered because their habitats have been affected by widespread use of pesticides. Throughout the course of the year the girls learned more about this. They also helped with the fundraising efforts at the school by creating a mural wall at the school for all of the families to see. The wall had flowers that were made by the girls and the school sent home "precious petals" which were sent back to the school with donations from the families and the families' name on it, and the petals were attached to the flowers the girls made on the mural. The girls also did a troop money earner to raise funds for the plants they planted in the garden. The plan for next year is to do another butterfly garden somewhere in town. Are you looking for some ideas on where to get leadership pointers? 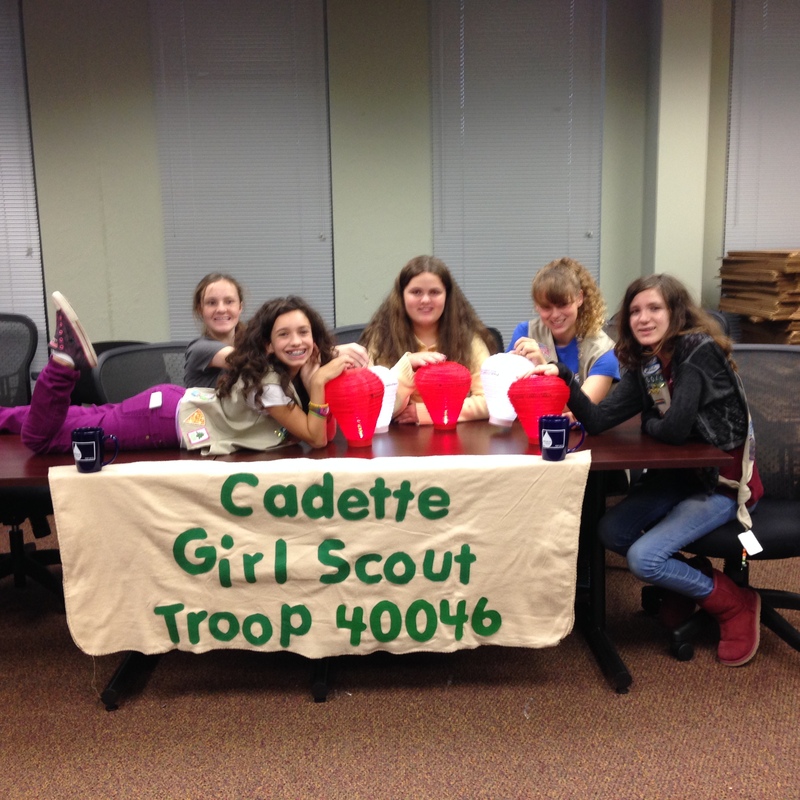 Check out this site created for you by Cadette Troop 40867 to find more information. Visit www.gstroop40867.wix.com/leadership. 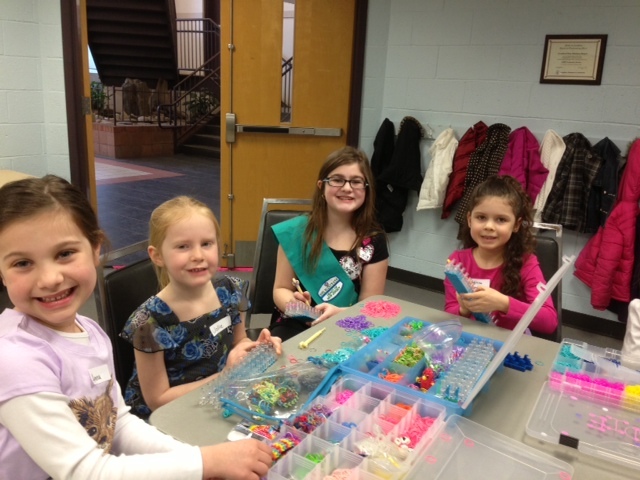 Junior Troop 40551 held a looming event for Daisy's in March. The Juniors and Daisy Scouts had a lot of fun making their creations. The troop earned $150 and they will use the money towards the plants for the butterfly garden that will be planted at the Calvary Nursery School in Cranford. The girls have volunteered several hours already at the school helping with after care children and creating the butterfly wall at the school. The Girl Scouts of Cranford will hold a community pancake breakfast on Saturday, March 15, from 8-11 a.m., at the Cranford United Methodist Church (Randolph Hall on the corner of Walnut and Lincoln avenues). The cost is $5 per person; Children under 4-years-old eat free. 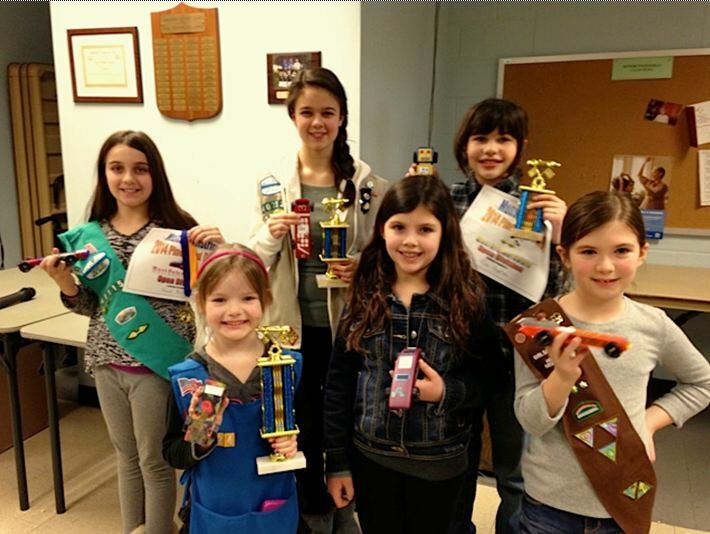 On March 1, 2014 six Girl Scouts from the Cranford Service Unit participated in the Munsee District Pinewood Derby. The Derby was open to all Boy Scouts who placed in the Pinewood Derby and Girl Scouts who placed in the Girl Scout Powder Puff derby that was held on January 18, 2014. Troop 40551 donating toys for Toys for Tots at the firehouse. They were getting into the Christmas spirit at Fire Me Up in downtown Cranford just prior to taking this pic. The girls were making ornaments and singing Christmas carols. But the real spirit of Christmas is giving, so we concluded our activity with donating to those in need. Girl Scouts in Cranford participated in a Scavenger Hunt for Daisies and Brownies and a Geocache event for Juniors through Seniors on Sunday, October 13, 2013. The girls and their families were given clues and coordinates that they could plug into their smart phone using a Google Maps application to find a particular destination. Once they arrived at the destination the girls either signed a logbook, took a small token from the cache/box or they had to perform a challenge given to them by an Ambassador Girl Scout from Troop 40376. Participants also enjoyed fruit and muffins from Edible Arrangements and Breadsmith. The girls and their families had a wonderful time exploring various locations around Cranford. The Girl Scouts of Cranford would like to thank Hynes Jewelers, Breadsmith, Vanilla Bean, Dovetails, Edible Arrangements, Just 4 Pooches, Evey Nails, JC and Crew, Sweet ‘N Fancy Emporium, Mr. J’s, Little Scoops, Periwinkles, Rocking Horse, Kilkenny House, Gourmet Deli, Il Giardino Restaurant, Atlantic Beach Soap Company, Dreyer Farms, The Hotel and Fire Me Up Studio for their participation and donation of gifts for the winners of the event. First Place winners of the Geocache were Grace Varga, Katherine Ruane, Natalie Schindler, and Olivia Schindler. Second Place team consisted of the Willis Family, and Emma Szark, Paige Carbone, Deirdre Tighe and Elizabeth McCaffrey took third place. Be on the look out in the Spring of 2014 for the next Scavenger GeoCache Challenge Hunt! Members of Girl Scout Cadette Troop #40334, Samantha and Grace, deliver their hand-painted banner to the Cranford Public Library hoping to encourage all Cranford students to be avid readers and apply for a library card. September is “Library Card Sign-Up” month. This is one part of their on-going literacy project as they work toward their Silver Award. Members of Cranford’s Cadette Girl Scout Troop 40334 spent part of the summer helping Bernice’s Place, an afterschool program for homeless children in Elizabeth as part of their Silver Award Projects. Grace, Samantha, Katherine and Isabella (not pictured) collected books and school supplies for the center, helped level hundreds of books, reorganized the library, and installed new bulletin boards for the center. Read the entire story on NJ.com. Four members have been working hard to earn the Silver Award for the past 10 months. Melanie, Morgana, Elizabeth and Meg of Cranford dedicated over 50 hours of service to complete their litter awareness campaign for the township called, "Your Town, Your Choice." The girls filmed a public service announcement, which will be broadcast on TV-35, as well as a display for litter awareness. Additionally, the girls created a 'trash to treasure' art exhibit for the Cranford Public Library. Read the entire story at the Cranford Patch. Are you looking for some healthy camping desserts and snacks to take on your next Girl Scout camping trip? Look no further! Senior Troop 40668 has created a blog for you to find recipes. Visit www.healthyrecipesforhealthykids40668.blogspot.com. Members of the Girl Scouts of Cranford Cadette Troop #40334 are currently working on their Silver Award, the highest award a Cadette Girl Scout can earn. During the Spring of 2013, Orange Avenue School 8th graders, Amber, Julia and Natalie designed and planted a new community herb garden at Hanson Park on Springfield Avenue in Cranford. Read the entire story at the Hanson Park website.